Fragments from the book "Yuri Zvenigorodsky, The Great Prince (The Grand Duke) of Moscow"
Konstantin Kovalev-Sluchevsky. Yuri Zvenigorodsky, The Great Prince (The Grand Duke) of Moscow. - M.: Molodaja Gvardia, 2008. - 486 p.: ill.
(A series "Life of outstanding people" - ZZL: № 1338. 7000 copies). A biography of one of the most prominent of Russian prince. This is a readable account of the Yuri Zvenigorodsky life, based on scholarly research but intended for the general reader as well as those who are already connoisseurs of Russian history. The author has considered the various facts and myths, legends and hypotheses. In result the author offers new datings. The majority of the known historical dates connected to Yuri Zvenigorodsky name, demand revision and changes. The author puts forward two ten new hypotheses. Even the text, which is published at the end of the given page of a site, - already possible to name out-of-date. The book is illustrated with virtually all the portraits and other pictures surviving which relate to prince Yuri Zvenigorodsky life. The book reflects Russian (Asian and European) life at the end of the 14th and in the beginning of the 15th centuries. The author worked in domestic archives and libraries for collecting materials for a spelling of the books about prince Yuri, about starting point and development of Russian state, church and cultural life in this epoch. 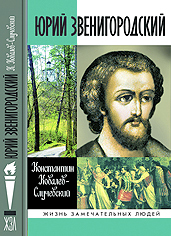 The book about Yuri Zvenigorodsky and his epoch was published in a series "Life of outstanding people" (ZSL, mass editions - 7000 copies). Now it is the thirst full and extensive biography, the main and capital works about the Russian prince. On this page the information on Yuri Zvenigorodsky and around his name, also a history of preparation and issue of the K.Kovalev’s book (and its subsequent destiny) is collected. “Our unremarkable northern landscapes of grassy vales have a moving fascination, particularly close to the Russian heart. The rustic vistas have not been blocked in our memory by either the view of Sorrento or Campagna of Rome; nor by the frowning Alps, or the well-tilled farmlands of England. The endless even green of our meadows is wholesome; our gently rolling land has something peaceful, trusting and artless, defenseless and gently melancholic about it. Something that is echoed in the Russian song, that touches a chord in the Russian heart.” These words written once by Alexander Hertzen would aptly describe the small and beautiful land, which has long been called Moscow Switzerland. Spas Zvenigorodsky (The Zvenigorodsky Savior or Christ the Redeemer). Andrei Rublev icon discovered in the Zvenigorod in 1918-1919. This land lies 60 kilometres West of Moscow and is crowned with an ancient town with a young and sonorous name – Zvenigorod (in Russian, this means “jingling town”). There exist quite a few legends explaining this name. Here is one of them. Yet another explanation also exists. The “Tale of Bygone Years” mentions three other towns called Zvenigorod, one not far from Kiev, one in the Ternopol Region, and the last around Galich. Of these, the most ancient town also stood on the bank of a river. In the gurgling of the river, our forefathers might have heard the tinkling of bells. Perhaps, the town of Zvenigorod near Moscow, built by the Slavs who had come from Kiev and Galich, also borrows its name from the soft murmer of the Moskva river. After that, the town became the centre of a large independent principality, a part of the Moscow principality, that is, the second town after Moscow. In the testaments of the Moscow princes, the town was always passed to the second son. The Savvino-Storozhevsky monastery appeared on the Storozhevoi hill to the west of Zvenigorod. The fortress of the Savva monastery was thus built: the stone walls and towers were erected. And within the walls – the czar’s palace (on the right side), a refectory, a bell tower (clock-tower), the chambers of czarina Maria Miloslavskaya (on the left side). After Dmitry Donskoy died in 1389, Zvenigorod was inherited, by tradition, by his second son, Yury Dmitrievich. With him at the helm, the town reached the peak of its prosperity. Of interest is the personality of this prince. Yury was born in November, 1374, in the town of Pereyaslavl-Zalessky. Saint Sergius Father Superior of Radonezh, who was close to the House of Grand Duchy of Moscow (Muscovy) was his godfather. Yury was brought up in an atmosphere of high culture and book-learning, typical of that time, but he would not shun battle either. The year the great battle on the Kulikovo field was fought, he was too young – only six years old, but after becoming an apanage prince at the age of fifteen, Yury participated in more than one campaign waged by the Moscow princes. During the reign of the ambitious prince Yury Dmitrievich, Zvenigorod flourished. On the prince’s orders, a rampart was built around the Kremlin, with a wooden wall and towers on top. In 1407, the white-stone Assumption cathedral was erected at the centre of Gorodok. Famous icon-painters, Andrey Rublev and Daniil Chernyi, were commissioned to work there. Trade and handicrafts thrived. In the late 14th century, the Savvino-Storozhevsky monastery appeared on the Storozhevoi hill to the west of Zvenigorod. First, a small wooden temple appeared on the site of the future monastery. The name of the monastery, Savvino-Storozhevskii, was after the names of the area and the first father superior. In 1399, saint Savva gave his blessing to the military campaign of his godson against Bulgars forettlling a quick victory over the enemy: “you’ll come back with the victory”. The monk’s prayer was answered and the victory was granted. The small church was then replaced by a beautiful monastery with a remarkable white-stone Nativity cathedral in the middle. This was a truly princely present, unprecedented in generosity; even the Trinity Monastery had no stone temples at that time. One was built only twenty years later, in 1423, in imitation of the Zvenigorod cathedral. A really golden age in the history of the Savvino-Storozhevsky monastery was during the reign of Aleksey Mikhailovich Romanov, called the “gentle”. It became the favourite rural retreat of the Czar and acquired the highest rank of a monastery – LAVRA. It was among the richest monasteries of Russia. In 1650, Czar Aleksey Mikhailovich issued the edict: “…at the wonder-working Savva Storozhevsky, Nikita Mikhailovich Bobarykin together with sexton Andrey Shakhov are hereby ordained to build, alongside the whole building , a 357 sazhen-long walled town of stone and rubble, with 7 towers, after the drawing attached. The white stone rubble and lime for this czar’s town are to be quarried and prepared in the Zvenigorod district”. The fortress of the Savva monastery was thus built: the stone walls and towers were erected. And within the walls – the czar’s palace, a refectory, a clock-tower, boasting the clock that the czar had brought from the town of Smolensk, the chambers of czarina Maria Ilyinichna Miloslavskaya and the Holy Trinity church were built. The erection of the fraternal buildings was started. The same years, the monastery bell tower, or belfry was constructed. In its central opening, there was the famous bell that weighed about 35 tonnes and was custom -made in 1667 by well-known craftsman Alexander Grigor’ev. Apart from sheet copper and copper from broken bells, conventionally added to bell metal, this bell’s cast had in it the “money copper”, that is, the copper coins (copecks), with which the czar had earlier tried to replace silver money, and which had been taken out of circulation after the known “copper riot.” The loud and melodious sound of this bell could be heard far and wide around Zvenigorod. It is not by chance that this bell was placed at the center of the city emblem personally approved in December 1781 by Catherine II. For many centuries, the Savvino-Storozhevsky monastery remained a prominent religious centre of Russia. At different times, czars Ivan the Terrible, Fyodor Ioanovich, Mikhail Fyodorovich came to pray there, and later - czar Peter I, crown princess Elizabeth and empress Catherine II. However, after the boom of the mid-17th century and a relative prosperity of the 18th century there came again hard times for the monastery. At the end of August 1812, after the battle at Borodino, both armies – the Russian and French were steadily advancing toward Moscow along the old Smolensk road. The Fourth corps of Napoleon’s army branched off from the main force in Mozhaisk and marched to Ruza, and on to Zvenigorod. “The enemy corps is now on the Zvenigorod road... I wish to God that, smitten by Moscow’s defenders, they met their death, should they dare to invade the capital,” — wrote the commander-in-chief of the Russian army Mikhail Illarionovich Kutuzov to count Fyodor Vasil’evich Rostopchin on August 30. The squadron under brigadier general Ferdinand Fyodorovich Vincengerode, which was sent to Zvenigorod, was confronted by French corps close to the monastery where the French had pitched camp. The brigadier general Vincengerode reported the following about this six hour- long battle to the emperor Alexander: “On August 31, the viceroy attacked me in Zvenigorod. My cossacs displayed unparalleled courage, two of their bravest field-officers were gravely wounded; we took prisoners without losing a single man; and by nightfall I ordered to continue our retreat”. Yuri Zvenigorodsky, The Great Prince (The Grand Duke) of Moscow (1374–1434). Having taken Zvenigorod in the early hours of September 1 , the French corps split, one part remaining in the town and the other staying in the monastery. The detachment was headed by the viceroy of Italy, the adopted son of Napoleon Bonaparte, Eugène de Beauharnais. In Napoleon’s Russia campaign, Prince Eugène de Beauharnais demonstrated his brilliant military gift on many occasions. His corps won fame in the battles near the towns of Vitebsk, Smolensk, Borodino and Maloyaroslavets and the river Berezina. In November 1812, when Murat had departed without permission, it was Eugène de Beauharnais who headed the remainder of the Great Army and brought it to Magdeburg. The prince was not only a brave warrior, he was also a wise diplomat and commander. His compatriots loved and honoured him and his enemies respected him. In late August 1812, this man chanced to be near Zvenigorod, at the walls of the Savvino-Storozhevsky monastery. For six weeks, the monastery was occupied by the French troops. The first night of their stay in the monastery, they posted sentries around the fortress walls, to forestall a sudden attack of cossacks. On prince de Beauharnais’order, guards were also placed at the catherdral, yet the main church of the 15th century cloister with the monastery’s most sacred object- Saint Savva’s relics, was laid waste. The next day, the palace buildings, churches, monastery’s sacristy, library and archives were also pillaged ; however, the Saint Savva relics remained intact. “Don’t let your men plunder the monastery and above all take anything out of the church. If you do as I ask, God’s grace will be with you and and you’ll return to your fatherland safe and sound”. Having said this, the old man quietly left the room. The prince, woke up early in the morning, Immediately he called the adjutant and told him to order the troops to prepare for a march back to Moscow. He let the adjutant go and went to see the church. Entering it, he saw a tomb and an icon. The face had a striking resemblance to the old man he had seen in the night. This was the face of Saint Savva. The prince bowed reverently to the saint’s relics. After this event, he fought in almost all the battles beginning from Maloyaroslavets, during the retreat of the French Army from Russia and later in the campaign of 1813 in Germany. In none of the battles was the Prince wounded; the words of the old monk came true: he returned unscathed to his fatherland, and even after Napoleon’s fall, he remained loved and respected”. Fifteen years after the death of Eugène de Beauharnais, duke Maksimilien Leuchtenberg fulfilled the will of his father: he did not fail to visit the St. Savva monastery and to bow before his relics. In the 19 century, Zvenigorod’s beautiful landscapes and climate, made it popular among Moscow noblemen, merchants, celebrated writers, artists, and musicians who spent the summer there. This place was visited by Levitan, Chekhov, Taneev, Shalyapin, Glazunov, Richter and Prishvin. There were more country estates of prince and count families near Zvenigorod than in other areas around Moscow; they numbered about 200 in the early 19th century. Now there are 27 of these, some of them, for example, Korallovo or Vvedenskoe, are almost fully intact. At the end of October, 1941, the German army was able to break the Mozhaisk defence line. On October 25, the enemy occupied the town of Ruza. In operations there appeared a new term, the Zvenigorod direction. The defence of Zvenigorod was launched. The 144th rifle division headed by Major-General Mikhail Andreevich Pronin was sent there. The Nazi troops preparing for an offensive on Zvenigorod were pounded by a hail of mortar and artillery fire. The city itself was in the state of siege since October 20. The whole adult population of the frontline town was building fortifications. Side by side with Red Army soldiers, the people of Zvenigorod dug trenches, set up strong points and hedgehog defence; explosives were planted in all large public buildings and electric power stations to be set off if necessary. The 23d Zvenigorod battalion also prepared for the battle, and partisan groups were formed. “December 1 to 4 were the hardest days for us. On these days the German headquarters undertook an outflanking maneuver in to the “double-pincer”movement. The first pincer was to close at Kubinka and the second one – at Golitsyno via Zvenigorod. In the morning of December 2, the enemy was only 2 kilometres from the town. To stall a sudden breakthrough, a so-called fire barrage was put up on the northern outskirts: it was a barrier of fallen trees and logs with a large number of bottles with the motor cocktail inside. A group of soldiers standing duty near the barrage had to set fire to it on seeing the enemy approach. Only towards the evening of the 3rd of December, was the danger of small or big pincer eliminated. To the east of Zvenigorod, the German troops were stopped a mere 25 km from Moscow and 10 km from the Western front headquarters in the village Vlasikha. The Germans announced the capture of Zvenigorod twice: at the height of the November offensive in the leaflets and on December 2 on the radio. However, the German propaganda was a bit hasty. On December 6 in the morning, the Russian army launched a counter-offensive on the right flank of the Western front. By December 20, the whole Zvenigorod region was free. The war was rolling west and the Moscow Switzerland began a slow return to a peaceful life. In the late 1940s, holiday-makers moved again to Zvenigorod. But not only tourists were attracted by the salubrious air, and landscapes, the climate and the ancient history of this land. Back at the turn of the 20th century a biological station of the Moscow State University’s Department of Biology was founded near Zvenigorod. Its history dates back to 1908, when on the grounds of Upper cottages, a student of the Department of Physics and Mathematics of Moscow University, and later professor Sergei Nikolaevich Skadovsky, built, with his own money a laboratory to study the freshwater organisms in their natural environment. In 1934, the biostation was handed over to Moscow State University. In recent years, senior and post-graduates students of the Departments of Geology, Geography and Physics also work there together with biologists. There are lots of places on Earth that can be rightly proud of their ancient history; there are many that are rare examples of primeval and perfect beauty. Zvenigorod is a unique land where hoary antiquity slumbers framed by beautiful landscapes; where the past meets the present, and where Nature benevolently smiles on people.